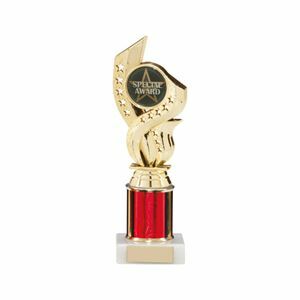 Celebrate volleyball success by creating your own womens' volleyball trophy with this Female Volleyball Trophy Figure Top. Available in gold, antique gold and antique silver, the screw-based figure top has been designed to to easily screw in and assemble with a range of compatible trophy bases, giving you options to create a volleyball trophy that meets your presentation needs. The figure top features a female volleyball player holding the ball high as if about to serve. 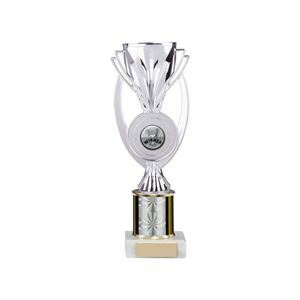 The Male Ten Pin Bowling Trophy Figure Top is a superior quality plastic figure top designed to fit on a range of compatible column trophy bases. 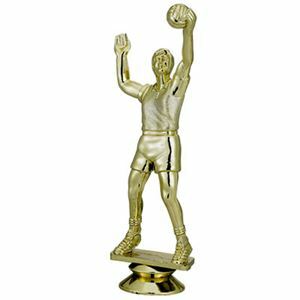 the figure itself displays a male volleyball player with arms spread as if preparing to serve the volleyball. 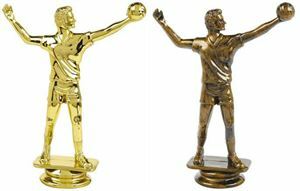 The Male Ten Pin Bowling Trophy Figure Top is available in metallic gold, antique gold and silver finishes and has a small screw fixing at the base of the figure, ensuring easy assembly with your choice of compatible base (sold separately).